This farm scavenger hunt printable is perfect to take along on your next trip to a petting farm! We love taking the kids to visit Green Meadows Petting Farm in East Troy, Wisconsin. It's a fantastic place to spend the day. We always pack a lunch and take advantage of their picnic area. There are lots of different farm animals for the kids to see and interact with plus play areas where they can run some energy out. This printable is for personal use or classroom use only, but you may save it and print off as many pages as you need for your group. 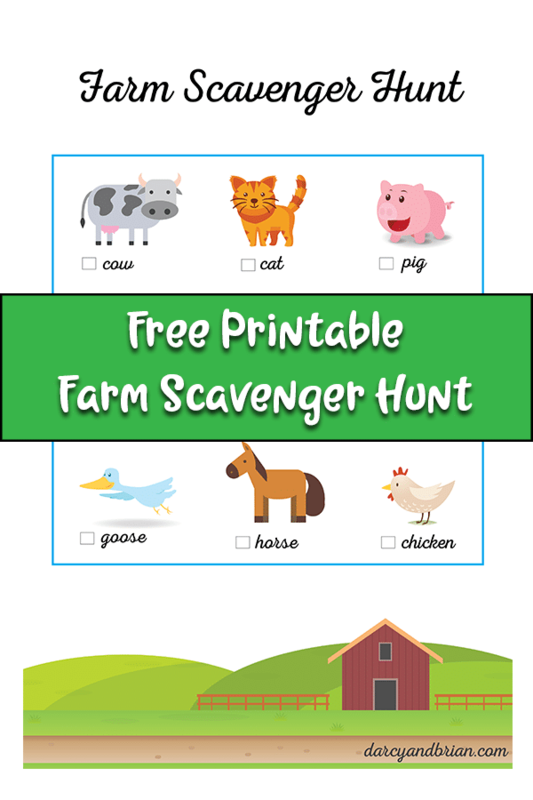 Click here to download our free farm printable scavenger hunt. When printing at home, please note that the quality of printables can vary depending on the type of printer and paper you use. If you do not want to print at home, you may take it to a local printing shop or a place like Office Depot. The scavenger hunt has pictures and words for the farm animals, making it a fun activity for kids of all ages. Younger children who are not reading yet can look at the pictures to identify the animals. 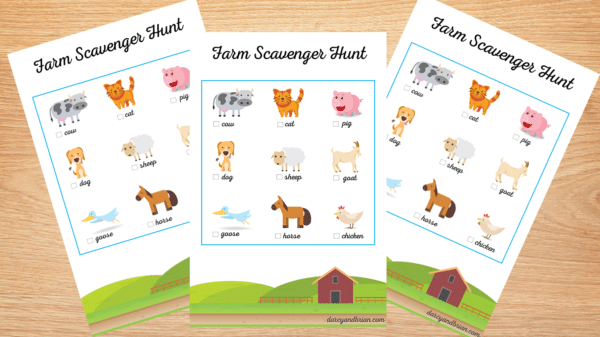 This farm scavenger printable includes a cow, cat, pig, dog, sheep, goat, goose, horse, and chicken. Heading to the zoo? Grab our printable zoo scavenger hunt too! As they see each animal, they can check it off the list. You can add more activities like asking them what sound each animal makes or what letter sound they start with. Not able to take a trip to a farm? Use this farm scavenger hunt to find matching farm animal toys. Your little one can place them on the animal's picture. We hope you enjoy using this printable scavenger hunt the next time you visit a farm or petting zoo!